A perfect, all-suite hotel in Yuma, Arizona located right off Interstate 8 next to the Yuma Palms Mall and near the Marine Corps Air Station -- free breakfast! 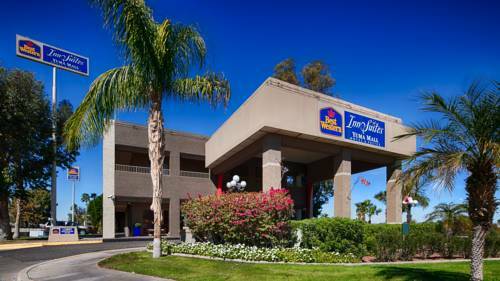 The Best Western InnSuites Yuma Mall Hotel & Suites is located in the interstate town of Yuma. Hotel guests will be in the ideal location for stopovers between Arizona and California. Hotel guests will also be close to popular area attractions including the Imperial Sand Dunes. Travelers will be minutes from the Yuma Airport, Marine Corps Air Station (MCAS) and Yuma Proving Grounds (YPG). Valued guests will enjoy enhanced amenities in every room including high-speed Internet, flat screen LCD television with premium cable, Cloud 9 beds with 100% cotton triple sheeting bedding, microwave and refrigerator. Extended stay two-room suites with kitchens and also deluxe, spa guest suites are also available upon request. A complimentary breakfast buffet and evening social hour is offered to hotel guests. Additional amenities include an outdoor heated swimming pool, tennis and basketball courts. This Yuma hotel offers 3,700 square feet of meeting and banquet space. An on-site, complimentary business center is also available. The onsite restaurant, PJ's Caf and Bar, makes dining easy and convenient. Local events near the hotel include the Midnight at the Oasis Classic Car Show and the Colorado River Crossing Balloon Festival. The friendly staff at the Best Western InnSuites Yuma Mall Hotel & Suites is ready to ensure a relaxing and memorable stay in Yuma, Arizona. Make a reservation today and save! Enjoy your stay. From: The north. Take Highway 95 and turn right onto Yuma Palms Parkway. At next intersection turn left onto Castle Dome Avenue. Proceed a quarter mile up Castle Dome Avenue. Best Western InnSuites Yuma Mall Hotel & Suites located on the left. From: The south. Take Highway 95 and turn left onto Yuma Palms Parkway. At next intersection turn left onto Castle Dome Avenue. Proceed a quarter mile up Castle Dome Avenue. Best Western InnSuites Yuma Mall Hotel & Suites located on the left. From: The east. Take Interstate 8 to the 16th Street Exit (#2), turn right (north) on 16th Street to Castle Dome Avenue. Best Western InnSuites Yuma Mall Hotel & Suites Left and follow curve. From: The west. Take Interstate 8 to the 16th Street Exit (#2), turn left (north) on 16th Stree. Then turn left onto Yuma Palms Parkway. At next intersection turn left onto Castle Dome Avenue. Proceed a quarter mile up Castle Dome Avenue. Best Western InnSuites Yuma Mall Hotel & Suites located on the left. PJ's Cafe, on premises, Full Service, American, Open for: breakfast, dinner, bar/grill, free healthy breakfast buffet, featuring scrambled eggs, make your own waffles, etc. Offering 2 complimentary cocktails, 5:00 p.m. to 6:30 p.m. daily.